Roman Bernhart, viola. Roman Bernhart, born in Euratsfeld, Lower Austria, attended the musician high school in Linz, a typ of school, which promotes the study of music as well as the normal general subjects. At the Conservatoire in Linz he studied instrumental teaching as well as violin and viola with Franz Wall before he moved to the University of Music and Performing Arts, Vienna to Siegfried Führlinger. In Upper Austria, Roman Bernhart joined the Ensemble Actuell under Franz Welser-Möst and also taught at the Music School in Wels. In 1993 he was chosen to join the Vienna Symphony Orchestra, and only one year later he became their principal violist. 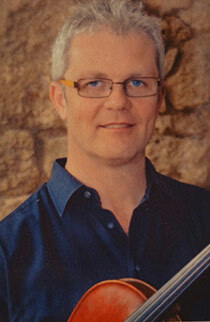 Since 1993 he has been a member of the Eos Quartet Vienna.